1 Fine Young Hen Turkey. 1 Pound of Lean Ham, Cut into Dice. 1/4 of a Teaspoonful of Pepper. 1 Bay Leaf, Minced Fine. 1. Clean and prepare the turkey for roasting as directed in the above recipe. 2. Put a saucepan on the fire and put in the ham cut into dice. 3. When hot add two pounds of the very best truffles and the grated nutmeg, the pepper and a minced bay leaf. 4. Stir over the fire for about fifteen minutes. 5. Then take off and let cool. 6. 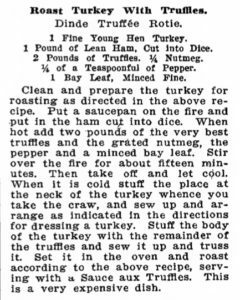 When it is cold stuff the place at the neck of the turkey whence you take the craw, and sew up and arrange as indicated in the directions for dressing a turkey. 7. Stuff the body of the turkey with the remainder of the truffles and sew it up and truss it. 8. Set it in the oven and roast according to the above recipe, serving with a Sauce aux Truffles. 9. This is a very expensive dish.